1 Pound Freshly Ground Organic Powder. Did you know that the moringa tress from head to toe is very beneficial? Below are some facts to know. Scientific analysis shows that Moringa contains more then 500 beneficial biochemical activities, and, in developing countries, it has been used extensively in the fight against malnutrition. As one of the rare trees whose leaves can be eaten as vegetables, the Moringa’s nutrients as easily absorbed and no allergy has ever been reported. Most of the nutrients of the Moringa tree are in its dry leaves, which can be made into a powder that can be sprinkled on food to add essential nutrients to any dish. Unlike synthetic vitamins, some “natural” multivitamins or even green powder supplement, the Moringa leaf is 100% natural. The leaves are delicious either raw or cooked, and nourish the body with a powerhouse of essential and even rare nutrients often lacking in our busy fast-food lifestyles. LEAVES: The leaves can result in rapid improvements in energy and endurance, mental clarity, balancing blood sugar levels and hormones, lowering blood pressure, boosting the immune system, relieving constipation and skin problems, and improving eyesight. •SEEDS: Seeds can be used for their antibiotic and anti-inflammatory properties to help relieve arthritis, rheumatism, gout, cramp and boils, or as a relaxant for epilepsy. The seeds can also be used for their aphrodisiac qualities. •FLOWERS: The flowers taste like mushrooms, and have been known to improve the flow and quality of mother’s milk when breast-feeding. 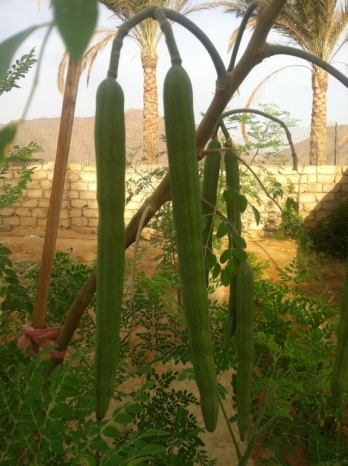 •PODS: The pods are also called “drumsticks” and taste like asparagus. The raw peas inside are a tremendous source of fiber, iron, Vitamin C, and potassium, and are an aid to liver and spleen problems. •ROOTS: The roots, which taste like horseradish, can work as an anti-inflammatory and help relieve rheumatism and arthritic pains, and for cardiac and circulatory problems. •WOOD: The gum of the wood is astringent and can be used to help with asthma. The bark is a rubefacient remedy and also good for digestive health. 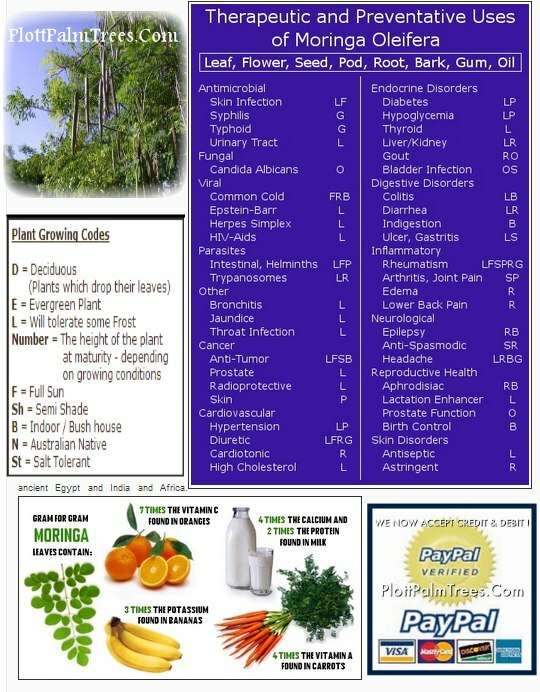 Did you know that the moringa tress from head to toe is very beneficial? Below are some facts to know. Scientific analysis shows that Moringa contains more then 500 beneficial biochemical activities, and, in developing countries, it has been used extensively in the fight against malnutrition. As one of the rare trees whose leaves can be eaten as vegetables, the Moringa's nutrients as easily absorbed and no allergy has ever been reported. Most of the nutrients of the Moringa tree are in its dry leaves, which can be made into a powder that can be sprinkled on food to add essential nutrients to any dish. Unlike synthetic vitamins, some "natural" multivitamins or even green powder supplement, the Moringa leaf is 100% natural. The leaves are delicious either raw or cooked, and nourish the body with a powerhouse of essential and even rare nutrients often lacking in our busy fast-food lifestyles. LEAVES: The leaves can result in rapid improvements in energy and endurance, mental clarity, balancing blood sugar levels and hormones, lowering blood pressure, boosting the immune system, relieving constipation and skin problems, and improving eyesight. SEEDS: Seeds can be used for their antibiotic and anti-inflammatory properties to help relieve arthritis, rheumatism, gout, cramp and boils, or as a relaxant for epilepsy. The seeds can also be used for their aphrodisiac qualities. FLOWERS: The flowers taste like mushrooms, and have been known to improve the flow and quality of mother's milk when breast-feeding. PODS: The pods are also called "drumsticks" and taste like asparagus. The raw peas inside are a tremendous source of fiber, iron, Vitamin C, and potassium, and are an aid to liver and spleen problems. ROOTS: The roots, which taste like horseradish, can work as an anti-inflammatory and help relieve rheumatism and arthritic pains, and for cardiac and circulatory problems. WOOD: The gum of the wood is astringent and can be used to help with asthma. The bark is a rubefacient remedy and also good for digestive health. GET WITH THE EARTHY FEELINGS : You are restored daily. DOES CONTAIN B12 in this moringa complex blend. Just now · This is my personal secret remedy food elixir and I have not brought it out till now... So check the new complex blend of our MORINGA COMPLEX (leaves, stems, seeds, flower blossoms, and drumsticks ). SUGGESTED USES: Add Moringa Powder To your Smoothies, About A Teaspoon Per Serving, Or Taste. Sprinkle Some Onto A Vegetable, Fruit, Or Even Ice Cream.You Can Add It To Soups, Sauces, Casseroles, Or Vegan Dishes. Take Care Not To Heat Moringa Above 118F Degrees To Avoid Damaging The Nutrients.Moringa Can Be Stored For Up To 2 Years In A Cool, Dry Place If You Keep The Air-Tight Container Closed. Five Years If you FREEZE IT. Cure For cancer Box Killer. B= BARK....G=GUM..... O=OIL.... F=FLOWER...... And Each Does A Completely Different Job, Make Sure You know Why You Are Taking The Moringa Is It For PREVENTATIVE USE Or Health Benefits Or As A Medicinal? To Use As A Medicine The Protocol We Like To Use Is By Taking The Three Day Challenge And See How Much You can Consume 1-3 Teaspoons For FIRST THREE DAYS IS THE GOAL...After That You Can Take A Tablespoon A Day Or Gradually Boost To 3 Tablespoons Throughout The Day... To Take 5- OR MORE Tablespoons (10-20 Capsules) A Day IS TO USE MORINGA AS A MEDICINAL. Since It Is VERY HIGH AMOUNTS OF MORINGA.